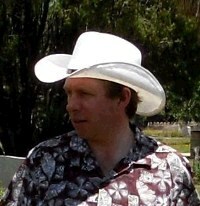 I lived in Italy for over year and have returned many times for work and pleasure. I travel extensively throughout the north but never went south of Tuscany as time and budget simply did not afford. Some of the most beautiful memories I have are from Verona. A very old city sitting more or less midway between Venenzia and Milano. Driving is forbidden in the old city and so one is allowed to wander without fear of being run over by motor bikes, cars and buses. History is found at every corner and alley, neatly framing the huge open air market which was once the center of social activity. Today it is bustling with tourists. Just today I found three pictures in an obscure place and so, immediately decided to scan and upload. 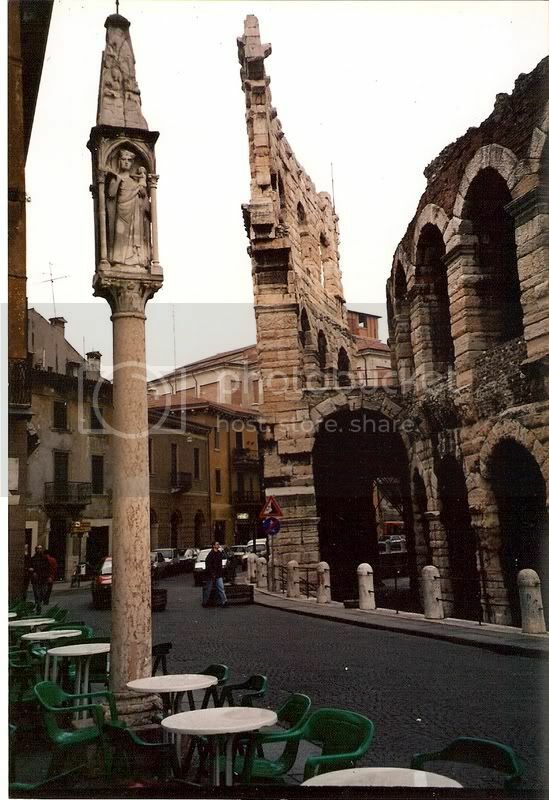 Some do not know, but Verona is home to the largest standing Roman Arena outside of the Rome. Today it is still used by the Verona Opera Festival which culminates with a performance of the famous Aida. This view is snapped from a curbside pub. I was unprepared for this visit, having previously spent very little time researching the history of the city before going there. It as a grave mistake and one which I seldom made. The Venetian influence is very evident in Verona. Many old walls and windows were made in the classic Venetian style of architecture. 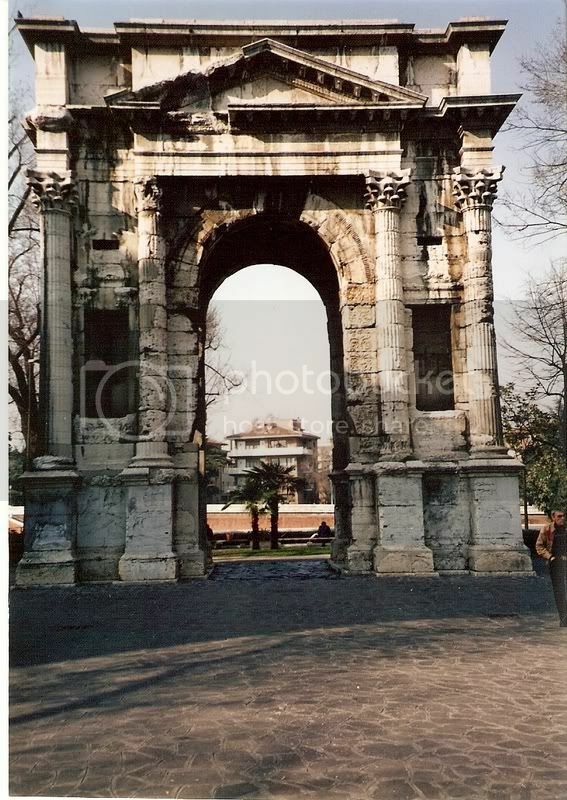 But amazingly much of the older Roman relics are still intact as evidenced by this very old gate on the edge of the old city. Of course Verona is also known as the city of Romeo and Juliet. 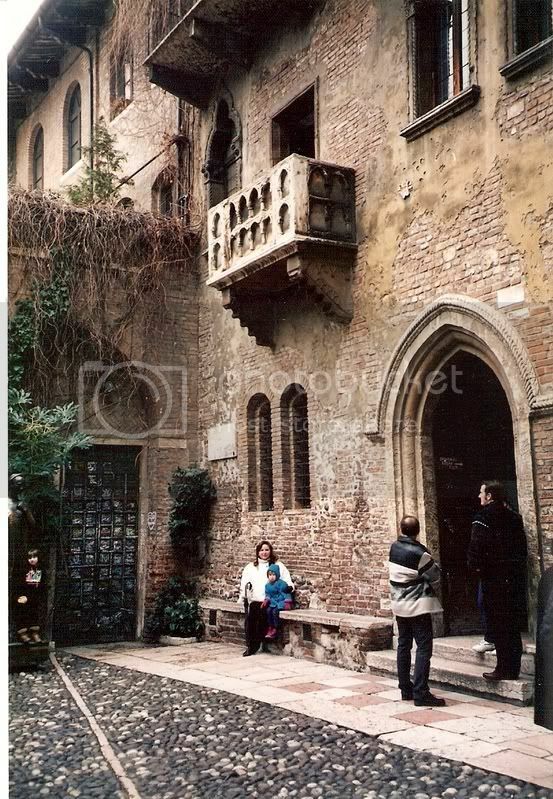 While the legend of the ill-fated lovers was made famous by Shakespeare, the residents of Verona have no problem displaying the homes of the Montecchi and Capuleti families the famous house of Juliet where she stood on her balconey. My wife and daughter sit on the bench under the famous balconey. The house is open for tours and they are very evasive about the legitimacy of the legend and the houses. Afterall, it was a love story - that's all that's important. At the end of the small courtyard to the left is a bronze statue of Juliette (a young girl stands on its base). It is claimed that if a young man rubs her breast he will have a good marriage. The statue is dark green from patina but the breasts are shiny copper. Just a taste of Verona. What a sweet one it was! Those pics are great FM. I just wish you had more of them. These places are not B.C. old but they have archaeological and historic interest. 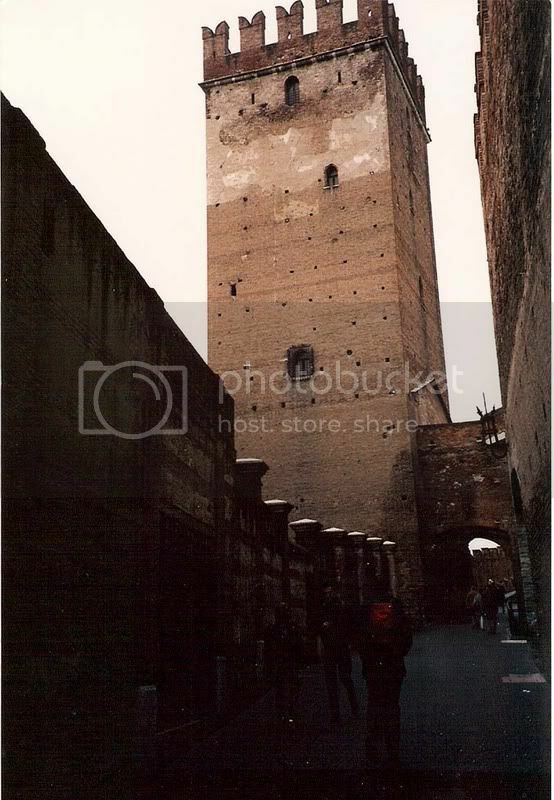 Today I found a stack of old photos from travels in Italy, so I can extend the Verona postings with a few new pictures. The Castelvecchio (translated Old Castle) was built around mid 1300's by Cangrande. The castle was completely destroyed by the germans during WWII as they fled the city. The replica was rebuilt on the old foundations shortly after the war. Adjoing Castelvecchio is Ponte Vecchio (translated Old Bridge). 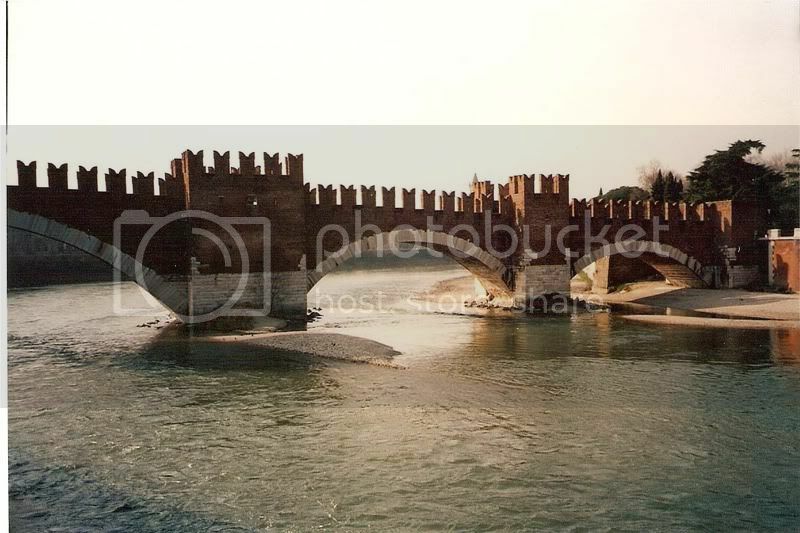 It passes over the Adige River and was to serve as an escape route for the castle residents in the event of a revolution or invasion. 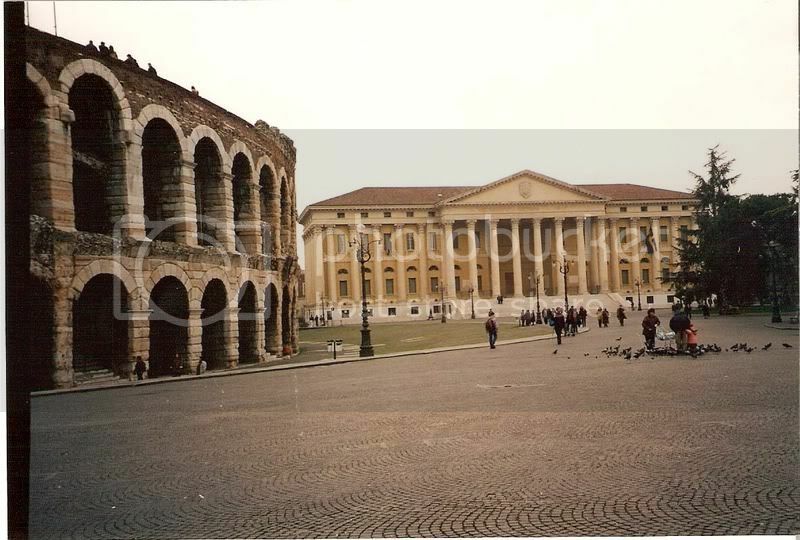 In Verona, like much of Italy, the old and the new are often side-by-side, here is an image of one side of the Arena near a much more recent administration building of some sort. I know people are very fond of English history and all that, but aside from a few cute Elizabethan houses, all I see are lumps of shapeless rock rolled into place by people whose main interests in life were annual rainfall statistics, twigs, and mud. Pictures like this really seem to illustrate the sophistication of other people's ancestors. Very nice, FM. Just think how much worse we have it over here, W/A. At least we have the Grand Canyon and much other natural splendor. I guess so, though I'd say the Grand Canyon, Yellowstone etc are all pretty big at leasts. North Wales is nice but probably not much to write home about compared to the Grand Canyon. They had an exhibition of works by him, Albert Bierstadt and others at the Tate here in London a few years back and this stuff just blew my nuts off, so to speak. Absolutely breathtaking. Thanks to you and Thomas Cole, I now have a brand new screensaver. I don't have any nuts. But every time now I switch on my computer, I get my t*ts blown off!